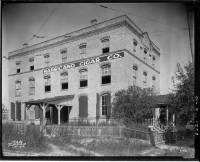 The Morgan Cigar Company was established in 1900 by Col. William T. Morgan, a native Georgian who learned the cigar trade while working at the Angel L. Cuesta cigar factory in Atlanta. When Cuesta moved to Port Tampa, Morgan accompanied him working in Tampa until 1900 when he moved to Seattle, WA to work for the Sanchez, Rodriguez & Co. cigarf factory. In 1905 he moved back to Tampa from Seattle, where he established Morgan Cigar Co. at the corner of Fremont Avenue and Arch Street. Morgan Cigar Co. better known brand was Juan de Fucca. Soon after the end of WWI, Benito Quintana, came to Tampa from Puerto Rico representing the Porto Rican Tobacco Marketing Co., which was a collaboration between tobacco growers on the island and Tampa manufacturers to promote the use of tobacco leafs harvested in the island as an alternative to leafs from Cuba. In July 1922 with his brother José and the assistance of Antonio Fisher, Benito organized a cigar manufacturing company. They leased a small space in the Morgan building from the Morgan Cigar, Co. to manufacture cigars for sale to customers in New York and Chicago. In 1943, the company organized by the Quintana brothers changed its name to Gonzalez Habano Co. and in the late 1950's the company re-organized once again and changed its name to Gonzalez Habano Cigar Co. and still operates to this date. Begining in the 1950s, they owned the building for a few decades. It is currently office space for Advanced Promotional Concepts who partially occupies the building and leases part for office space.